The Violent Criminal Enterprises Bureau seeks to stem gun violence and other criminal activity perpetrated by gangs and narcotics organizations operating in Brooklyn. The bureau uses multiple investigative strategies, including sophisticated analyses of social media, electronic communications, and other data, to build successful conspiracy and enterprise corruption cases against offenders and thereby incapacitate and dismantle these violent enterprises. One focus of the bureau is the investigation and prosecution of known street-gang members who have committed serious offenses, including the possession and sale of firearms and other violent crimes. In addition, the bureau conducts gang awareness training, working with community groups and educational agencies throughout Brooklyn. The bureau also investigates and prosecutes individuals and organizations involved in the trafficking of large quantities of drugs in Brooklyn. The bureau develops long term investigations into suspected criminal narcotics enterprises and into organized drug activity in specific communities. Brooklyn assistant district attorneys work closely with the New York City Police Department, federal agencies, detective investigators assigned to the office, as well as with community groups and religious and business leaders, to combat drug distribution and related violence in Brooklyn. A year-long investigation by the Brooklyn District Attorney’s Office and the NYPD shut down this alleged trafficking ring, which sold 112 firearms, including 20 assault weapons, to an undercover officer. It revealed that the ringleader, Michael Bassier, allegedly took cheap Chinatown buses to the Atlanta, Georgia area, where alleged accomplices acted as straw purchasers to obtain guns that he then brought back to the city. He’s also accused of making car trips to Pittsburgh, Pennsylvania, where he also obtained guns from stores, pawn shops and websites. Three of the defendants who were charged with conspiracy and other counts were arrested in Georgia and two others in Pennsylvania. Bassier allegedly paid between $150 and $300 per gun, and paid the straw purchasers a fee of $50 per gun. The undercover cop – conducting almost all the buys in a parking lot of a Walgreens pharmacy in Canarsie – paid on average $800 to $1,200 per gun, and between $2,000 and $2,500 per assault weapon. These figures demonstrate how lucrative the illegal gun trade is. The long-term undercover operation is the third such successful investigation since 2014. Over 300 firearms were recovered in the previous two, which involved guns transported from Georgia by car and on passenger airplanes. 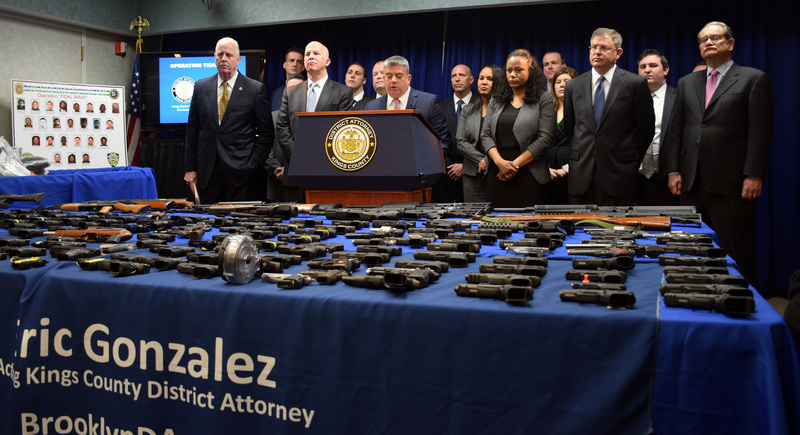 The Brooklyn DA’s Office is the only local authority in recent memory to apprehend out-of state defendants who smuggle illegal guns into our city. Furthermore, the DA’s Violent Criminal Enterprises Bureau, working with detectives from the NYPD’s Firearms Investigations Unit, have taken almost 1,000 guns off the streets of Brooklyn. As this case shows, the DA’s Office goes far beyond Brooklyn’s borders to keep our communities safe from gun violence.